The electric dark ride was called a Pretzel, after the company that invented the ride: the Pretzel Amusement Ride Company of Bridgeton, New Jersey (45 miles west of Atlantic City). The founder, Leon Cassidy, patented the concept in 1928. At the time, many parks had a Mill Ride, in which boats traveled in a flume, propelled by the moving water. Cassidy's goal was to create a Mill Ride that did not require the problematic, heavy, and expensive water. His electrified track made so many twists and turns that a rider said he felt like a pretzel. The name stuck. 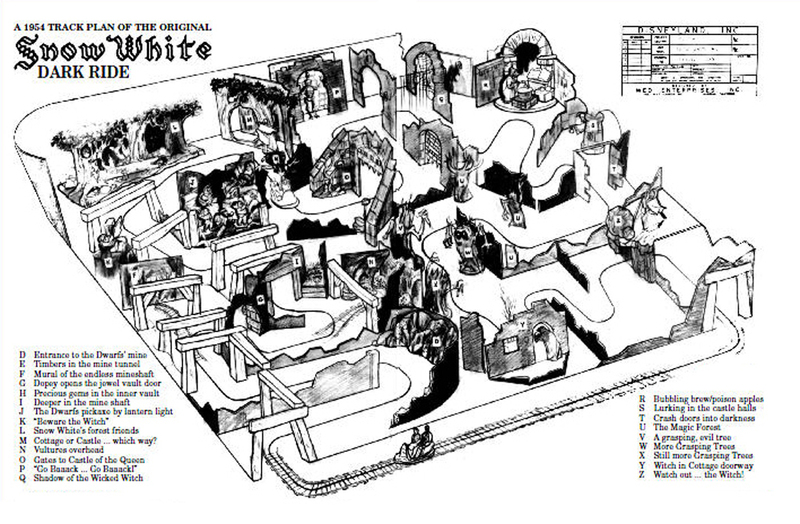 Before Fantasyland was designed, Walt knew he wanted a Pretzel ride themed to the dark, brooding Brothers Grimm tale of Snow White, first published in 1812. 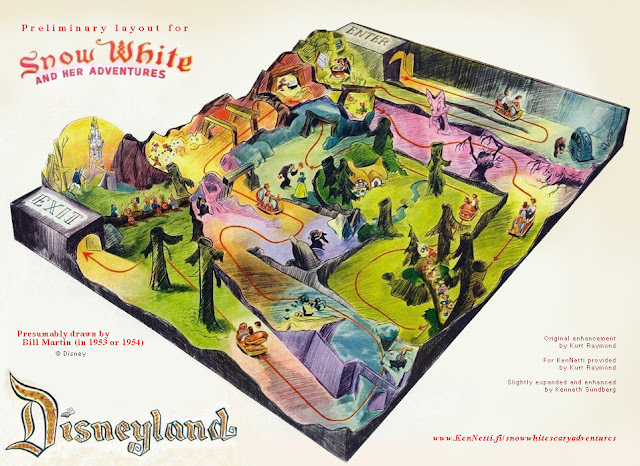 Walt planned to employ the atmospherics—the foreboding forest, the diamond mine, and the Queen's castle—of his 1937 version, Snow White and the Seven Dwarfs, of course. Art Director Ken Anderson was responsible for the finished attraction, but WED art directors Marvin Davis and Bill Martin sketched it first. Anderson decided that the viewer would take Snow White's place, racing through the threatening forest, encountering the queen dressed as an old hag, and so forth. None of the scenes would feature the title character—you were the heroine of this adventure. 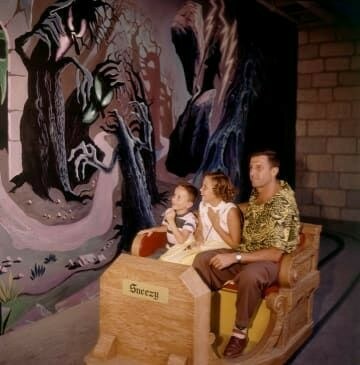 Anderson was surprised when guest polling after the park opened revealed that, as Ken told E-Ticket, "Nobody actually figured out that they were Snow White. They just wondered where the hell Snow White was." Anderson's ride was designed to be scary. One room was kept eternally dark by crash doors (so that the light from another scene wouldn't illuminate the darkness). 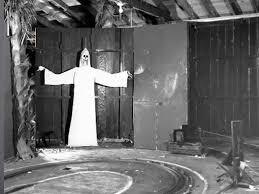 Employing an old amusement park trick, Anderson dangled strings over the track in this pitch black room. In the dark, something unknown brushing past your face is terrifying. By limiting the string's length, he targeted only the taller adults—what could be scarier to a child than inciting goosebumps on the adult riding with them? "It was just as scary as I could make it," Bradley said of his Haunted Castle. He was a consultant on the Disneyland project. "I had kids that would ride through there a hundred times before they ever opened their eyes...and those were the ones that enjoyed it the most." Over the years, the Snow White ride has been made steadily less frightening, and the name was changed to "Snow White's Scary Adventures" as a warning. 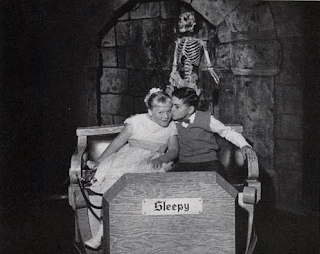 In 1955, Walt took Dave Bradley's advice and had one ride in all of the Magic Kingdom that was designed to sneak up on a child, grab him by the throat and say "Boo!" Illustration from E-Ticket magazine. The string gag was just after "T."